Mike Padilla’s debut collection of short stories explores the experiences of diverse Mexican Americans struggling, surviving and thriving in the U.S. Among his snapshots, he details a machinist’s jealousy becoming entwined with dark resentment of his wife’s English-speaking abilities; the uneasy bonds holding together two elderly women, once best of friends, but now only housemates; and a nervous romance between a fourteen-year-old Mexican tomboy and a clumsy young Russian émigré who falls all too hard for her. 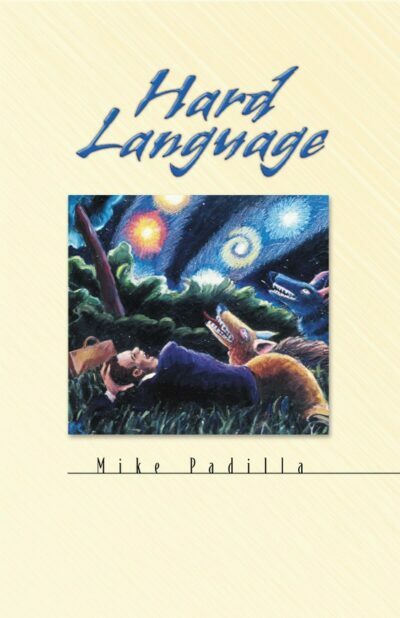 Hard Language won the University of California at Irvine’s Chicano/Latino Literary Prize and the San Francisco Foundation’s Joseph Henry Jackson Literary Award. “Mexican-born husband and wife Antonio and Pilar have been living legally in Southern California for over a year and a half when Pilar announces that they’re both going to learn English. This is in the book’s title story. ‘There’s no way we’re going to get ahead if we don’t know the language,’ Pilar tells her husband, a scrap metal worker who wants to open his own business. Antonio is reticent. English is a hard language, he’s found. Trying to speak it has always been, he thinks to himself, like trying to tie a cherry stem into a knot with his tongue. But he agrees to attend class with his wife. This brings nothing but trouble. After one session, he becomes terribly jealous of the instructor. When he and his wife make love, she wants to use English for pillow talk and he finds this deeply frustrating. “A stubborn drive to better their lot motivates the Mexican and Mexican-American protagonists of the eight stories in Padilla’s strong debut collection. Zeroing in on unexpected, illuminating situations and relationships, Padilla examines issues of language, progress, assimilation and family, setting his narratives in Tijuana and communities in California. In ‘Flora in Shadows,’ as in several of the tales, loyalty to friends and family competes with the desire to get ahead. Flora and Alicia, middle-aged former best friends, grow close again when Flora’s husband dies and she moves in with Alicia. But Flora, who drinks too much and won’t get a job, threatens to destroy the life Alicia has built for herself, and Alicia must decide just what their rocky friendship means to her. In ‘The King of Snow,’ Jorge Morales is a freshman at Stanford, the one member of his family to make good. He is fiercely loyal to his brother, Martín, as drug dealer who made sure Jorge wouldn’t have to follow in his footsteps. When a beautiful girl with a coke habit asks Jorge to do her a favor, however, Jorge loses sight of his goals, only to be rescued one last time by Martín. One of the most moving stories in the collection, ‘Carrying Sergei,’ tells of the unusual friendship between tomboyish fourteen-year-old Margarita and Sergei, a scrawny Russian immigrant boy and gift pianist. Margarita bullies Sergei at first, but after she is welcomed into his unorthodox home, she grows to love him and makes a supreme sacrifice for his sake. Love turns sour in title story, when a young married immigrant cannot curb his jealousy. Antonio encourages his wife to learn English with him and help out in his new business, but in the end sabotages his own best-laid plans.